Why buy a $50 Philips Hue bulb when these $16 smart LED bulbs don’t need a hub or Wi-Fi to work? Most of our readers probably realize by now that spending $50 per bulb on pricey big-brand smart LED lights isn’t necessary to put together an awesome and versatile smart lighting setup. In fact, you don’t need to spend anywhere near that much. There are plenty of great options out there, but there’s one in particular that you should check out. 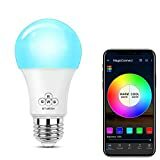 It’s called the MagicConnect Bluetooth Mesh Multicolor Light Bulb, and it has two things that set it apart from a solution like Philips Hue. First, it doesn’t need a hub or even a Wi-Fi connection to work. And second, it’s WAY cheaper than Philips Hue! ✔ Control a of maximum 64 bulbs together at one time. Mesh bulbs link to each other automatically as a local area network allowing for a greater range of control, and allows for multiple mobile device control at the same time. ✔ No hub required, and compatible with other MagicConnect Bluetooth Mesh products. Also, you can create many groups to control, one bulb can be set to a maximum of 8 groups, it is the perfect choice for household and engineering lighting. ✔ Various Modes: 16 Million Color Setting, Group Control, Sunlight, Timer, Music Sync, Sunrise, Sharing Control, Unlimited Patterns. If you just need a few bulbs, this is a perfect choice. If you need many bulbs for whole house or big project, this is also a perfect choice. ✔ Application: Multiple lighting patterns, suitable for a showcase, residential, office, hotel, shop, exhibition room, landscaping etc.